Please visit our FAQ page for our most frequently asked questions. 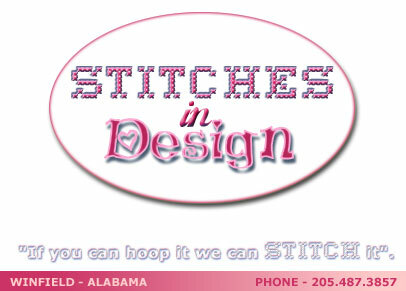 Stitches in Design, located on County Highway 10 in Winfield, Alabama, has been servicing the Marion County area, and beyond, for the past five years. Owner, Jean Taylor, opened Stitches in Design in 1996 and the business has steadily grown. At Stitches in Design we strive to satisfy your every need in personalized apparel and other various items. Our product line ranges from athletic apparel, children's and infant casual-wear, Men's and Ladies shirts, blouses, casual dress and sport-oriented wear. We also keep an assortment of toweling, baby bibs, blankets, tote-bags, caps, and other sundry items. In fact, we can...as our motto states, stitch and personalize almost anything. You're only limited by your imagination. At Stitches in Design we have no minimum order required. Purchase what you need when you need it...it's as simple as that. Please note before calling in an order... We absolutely DO NOT sell any garments, or miscellaneous items without design work, monograms, or sublimation work on them.